"Red wine with fish. Well that should have told me something." Quintessential Bond, Connery or otherwise. As only the second installment in the franchise, it's incredible how fully formed From Russia with Love already feels. In particular, it does a lot of heavy lifting to establish the Bond universe that will help shape the future of the series. This is the first (and interestingly, one of the last) times we see inside of Spectre, the evil counterintelligence network determined to kill James Bond or take over the world (whichever is more convenient at the time). It's also the first time we meet Ernst Stavro Blofeld (and his signature white cat), the head of this shadow organization and a character so iconic he would also become the head villain in the parodic Austin Powers series. this groundwork not only pays off endless dividends later but also makes the film itself that much more immersive and enjoyable. All the tropes which would eventually become iconic identifiers of what it means to be a James Bond film are here, from the cold open (with a twist) to the femme fatale who straddles the line between being seduced and being taken advantage of. The film also pushes the boundaries on the theory that the Bond films exist because Sean Connery looks good walking around in a suit: a large portion of the plot just consists of 007 walking from one scene to another (or in a few cases taking the train), and there's often as much visual pleasure in the exotic locations Bond finds himself traveling around as there is in the man himself. 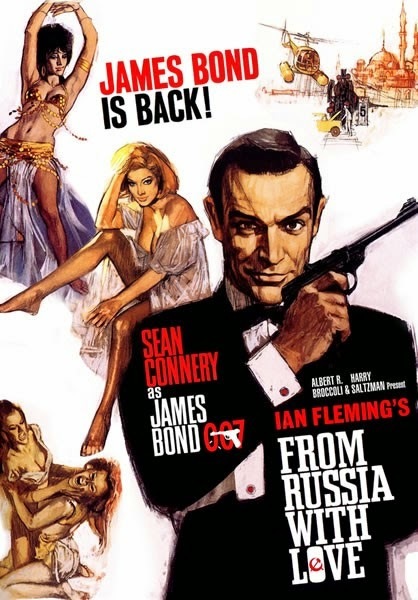 And speaking of exotic locations, From Russia with Love is the film which cemented the franchise's engagement with Cold War politics. It's no coincidence that Dr. No was produced almost immediately following the Cuban Missile Crisis, and here these international tensions are played out against the backdrop of Spectre planning to steal a cryptography device and sell it back to the Russians. Bond is constantly being pursued by Soviets, faceless assassins, or both, creating the paranoid atmosphere which defined that period in world history. With all this hard work it's doing behind the scenes, it's still a marvelously fun ride, with enough twisty thrills and action set pieces to satisfy even the most impatient of modern audiences. A must see for Bond fans. One of the very best. - Is Javier Bardem in Skyfall an echo of Lotte Lenya? She comes off as a creepy lesbian hitting on Daniela Bianchi in the same way as Bardem flirts with Craig. As aggressively heteronormative as Bond is, it's no surprise that the series has a history of demonizing queerness. - Is there a connection between the films' early tendency toward casual racism and their love of foreign locations? Something about how exotic the outside world is, enjoying the other as exotic, reasserting the racial other as outside of "real" society?